The group’s biannual Living Planet Report said the natural world was being degraded “at a rate unprecedented in human history”. Terrestrial species had declined by 31% between 1970-2003, the findings showed. It warned that if demand continued at the current rate, two planets would be needed to meet global demand by 2050. The biodiversity loss was a result of resources being consumed faster than the planet could replace them, the authors said. They added that if the world’s population shared the UK’s lifestyle, three planets would be needed to support their needs. The Living Planet Index tracked the population of 1,313 vertebrate species of fish, amphibians, reptiles, birds and mammals from around the world. It found that these species had declined by about 30% since 1970, suggesting that natural ecosystems were being degraded at an unprecedented rate. The Ecological Footprint measured the amount of biologically productive land and water to meet the demand for food, timber, shelter, and absorb the pollution from human activity. 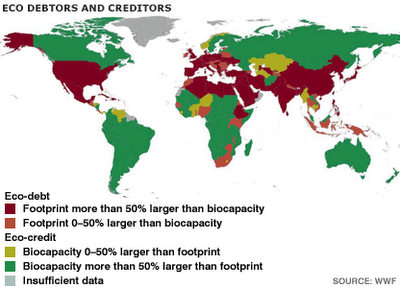 The report concluded that the global footprint exceeded the earth’s biocapacity by 25% in 2003, which meant that the Earth could no longer keep up with the demands being placed upon it. The findings echo a study published earlier this month that said the world went into “ecological debt” in October of 2006. The study by UK-based think-tank New Economics Foundation (NEF) was based on the Ecological Footprint data compiled by the Global Footprint Network, which also provided the figures for this latest report from the WWF. One of the report’s editors, Jonathan Loh from the Zoological Society of London, said: “[It] is a stark indication of the rapid and ongoing loss of biodiversity worldwide. “Populations of species in terrestrial, marine and freshwater ecosystems have declined by more than 30% since 1970,” he added. “In the tropics the declines are even more dramatic, as natural resources are being intensively exploited for human use.” The report outlined five scenarios based on the data from the two indicators, ranging from “business as usual” to “transition to a sustainable society”.